I landed in Montreal airport after a very quick flight from Newark Airport in NYC and was struck with French instructions, French speaking people and I was hit with a moment of panic. I’m here alone, so I have to figure this out on my own. Where to go and what to do to get through customs, where to get my bags and then how to get to where June is going to pick me up. How to contact June and even how to order and pay for a coffee. I settled the panic and took it a step at a time and it worked just fine. The only hiccup was that June was expecting I would take much longer to get through customs and get my bags (based on previous experience) so she was 15 minutes away when I got to speak to her first. Great! I said, time for me to get a coffee. Off I toddle (thanks Mum) to the coffee shop, as for a flat white and you would think that I asked for an elephant in a cup. He had no idea what I was saying. Changing the instruction to a “latte, “o go” seemed to work. The guy before me get a coffee and it was less than five dollars. So, I go to the plastic bag filled with the Canadian cash of Mum’s from 1994 and pulled out three $2 notes – $6 will be plenty. I handed him the $6 and he looked amazed and says “wow”. “Oh, are they old?” I say? “Yeah! Are you sure you don’t want to keep them?”. Nah, I say, I’ve got more. I only found out later, that similar to Australia, $2 notes were replaced with coins many, many years ago. He he he. No wonder he was shocked. So, coffee in hand I head out to where I told June I would be, and looked for a black Kia. Not long and we were off, we stopped in a beautiful front patisserie and June got a coffee and something to eat and eight croissants to take with us. Not really knowing where I was, or where I was going I happily listened to the family stories June told, I took notes, and we kept driving. Seven hours later we were at Roger and Jenn’s house. 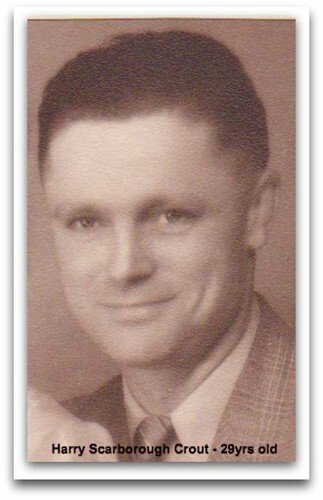 Roger is the grandson of Annie Ruby Crout. Annie Ruby Crout is my Grandad Harry Scarborough Crout’s sister – same father – Harry Eden Crout and same mother – Marie Ogilvie. Roger had no idea my grandfather existed until a day or so before and yet, he warmly invited us to come and stay when June contacted him to see if we could meet up. Because Roger is part of the line of Canadian Crouts that stem from Annie Ruby, he is a full blood relative, and it was very important, if at all possible for me to meet him while I was in Canada. June knew this and so had worked very hard to get in contact with him to see if there was some way she could arrange it. I met Roger and his wife Jenn and was handed a glass of wine. June and I explained where I fitted in, which Roger admitted was still a bit overwhelming. They were fascinated and so pleased that we had “reached out”. They both have complicated histories and so didn’t really know their extended families growing up and Jenn said she has enjoyed meeting her cousins as adults more recently. We sat by the fireplace, drinking wine and telling family stories and I met Frank, the big sook of a cat. We drank coffee, ate croissants and June shared some stories, documents and photos and Roger shared what he had. Then Roger took June and I for a tour of their property on the “Polaris” – we rugged up – it was pretty cool and we assured it would be cold on the tour. What an exciting (and a little hairy at times) way to see the spectacular property of Roger and Jenn’s. We took photos in front of the fireplace, said our goodbyes and armed with a map, June and I were off to meet Jane – a Cozens cousin. I am in the middle of the best story I have ever read. There is nothing I love more than getting completely engrossed in a story, so that even when I’m not reading it, I am thinking about it and wondering what will happen next. This doesn’t often happen to me, it has to be the right mix to really pull me in, otherwise I get bored, put the book down and then never finish it. No chance with this one. It is a story full of intrigue – mystery, love, family, war, discovery, understanding, reconciliation, honesty, loyalty, respect and loss. It is the story of two cousins, with the same Grandfather, but different Grandmothers, on opposite sides of the globe, finding one another and then working as a team to piece their shared history together. A history that is more unbelievable than any fiction they have ever read and is far better, as it is the truth – their truth. 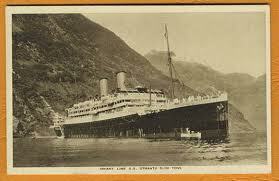 They were both the historians of their families, with a trunk full of photos, certificates and memorabilia to share. The communication was via email, daily in the beginning, and most days with multiple emails. Most emails contained multiple attachments and were received by the other always with great appreciation of the time taken to compile and share. Their shared love of discovering the story spurred each other on to keep scanning and sending anything they could find that was relevant, to help map out the story, as well as bring the people alive. This story continued over two and a half years as they both became completely obsessed with ensuring that this story was documented accurately and with compassion and understanding. Then tragically, their story came to an end as one of them died, very suddenly. That person was my Mum and the other person was June Kendall. Their story started in June 2011, and with June’s permission I have begun reading the emails between the two of them. In three days, I have read more than 130 emails and looked at every attachment. I am so sorry to know that I only have about another 50 or so to go until this part of the story ends. The wonderful part is that it is all there, documented for me to read and then to go back over, look at what Mum has pieced together and ordered so far, fill in some missing blanks and then share the story, here, on Mum’s blog that she started the year before they first met. Perhaps that will awaken the passion to finish the discovery that I believe died in June when she lost my Mum. She said that I would understand how much she missed my Mum when I read their emails, and she was right. I now know just how important they were to each other, and how tragic it was that they only had the three years together before Mum died and they never got to meet each other, or even hear each other’s voice. I don’t even need to ask June whether I would have her blessing to write the story here, as I know, from their emails that is what they both wanted – for the story to be told honestly and compassionately and be there for the world, but in particular the descendants to know. There may just be other descendants, like us, who want to understand how there came to be two families, joined by the same man on two separate continents, who never knew the other branch existed. There may be even other people completely unrelated that will find the story fascinating. As well as finishing reading the story in the final 50 emails, I need to work out exactly how I want to go about telling it…. So, if you would like to join me on the journey, watch this space …. 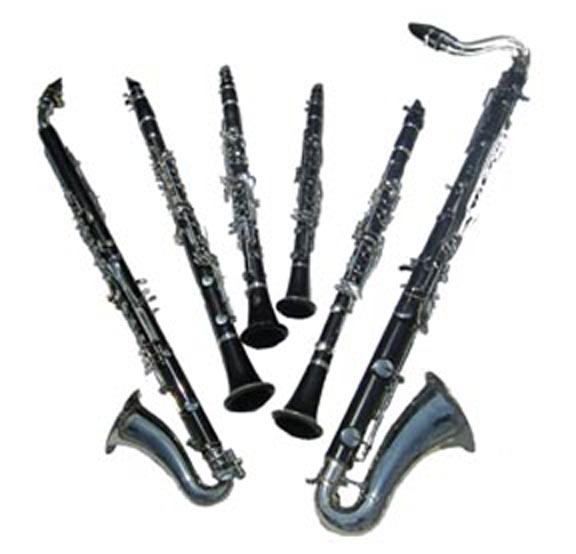 Dad certainly had one fact about his mysterious father correct – Henry (Harry) Eden Crout was indeed a Musician, a Clarionet player, in the British Army. It seems unlikely, however, that he knew that many of his father’s Ancestors were Seamen, and Mariners of some note, for no doubt he would have regaled us endlessly with delightful tales of amazing adventures on “the High Seas”. 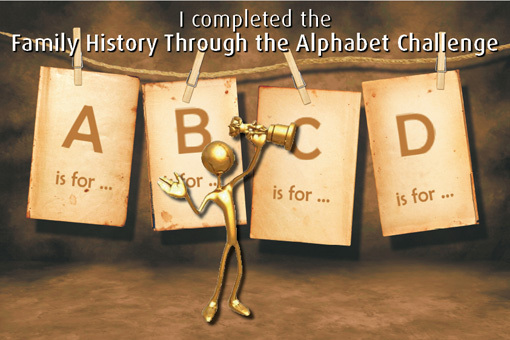 I dedicate this “Family History Through the Alphabet Challenge” to my dad, Harry Scarborough Crout and his paternal Ancestors, those “Mysterious Musicians and Mariners”. Dad came to Australia, a sixteen year old lad, as part of the “Dreadnought Scheme”. He came for adventure, and to make his fortune “to take home to mam”, but events overtook him and he remained in Australia. Whilst he talked a lot about his mum, her family and growing up in Shipley, Yorkshire, he had litte information to share about his dad. He seemed reluctant to talk about his father saying he hardly knew him because he was away a lot with the Army. I also remember dad saying that the family’s, of both his mother and father, never “got along”. My search for this “Mysterious Musician”, my Grandfather, began with a copy of the Marriage Certificate which both confirmed and confused. 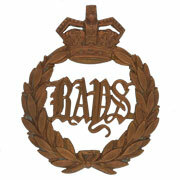 The best clue was the recording of his profession as “Private 2nd Dragoon Guards”. 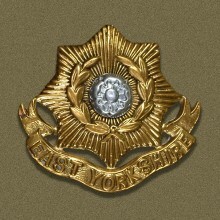 It didn’t take long to discover that the Regimental Band of the 2nd Dragoon Guards was stationed at Fulford, York, Yorkshire, England in 1899 which is the same year that he met and married my Grandmother, Marie Ogilvie a Yorkshire lass, in York. Henry (Harry) Eden Moody, whose name and his mother’s was changed to Crout on the 1891 Census, was born in Battersea, London, England on 21 March 1880. Below is a picture of his son, Harry Scarborough Crout, at about same age. Reading that my Grandfather had a Cross and Anchor tattoo, which I later discovered is a “Maritime Cross”, flipped me right back to that Marriage Certificate. Not only does he incorrectly name himself, and his father as Harry Edward Crout when both were Henry Eden Crout but also wrongly claimed his father to be a “Retired Seaman”. What is going on here?… thinks I. Many hours, days, weeks, months and now years of research are finally bringing the answers. He used his Grandfather’s name for himself and his dad, when marrying, and also his Grandfather’s profession. It is his Grandfather who is Henry Edward Crout (1814 – 1875) and he was indeed a Seaman, first going to sea at the age of 16. The possible reasons my Grandfather gave mis-leading information is another story, for another day. 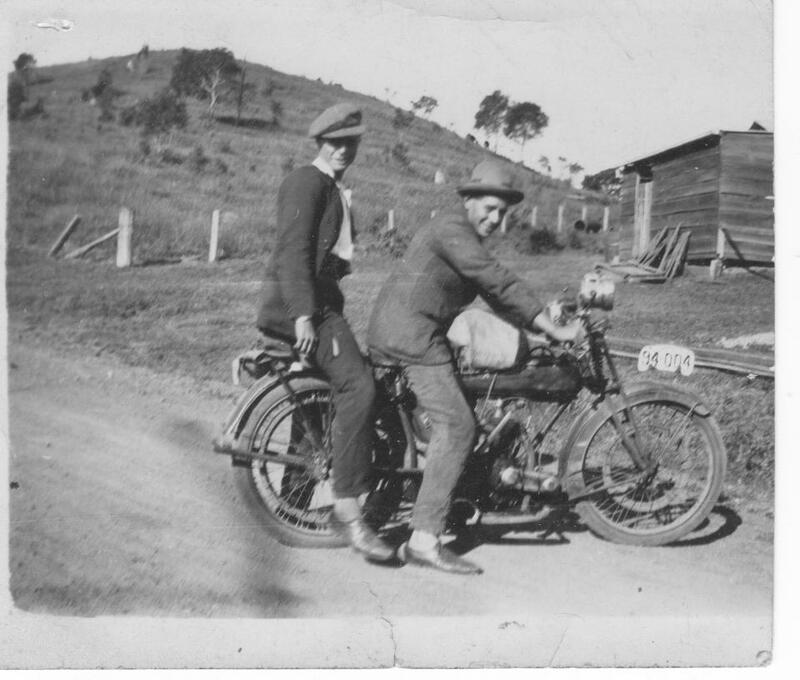 Suffice to say their daughter, my dad’s sister Annie Ruby Crout, was born 22 Dec 1899 and just one month after they married. 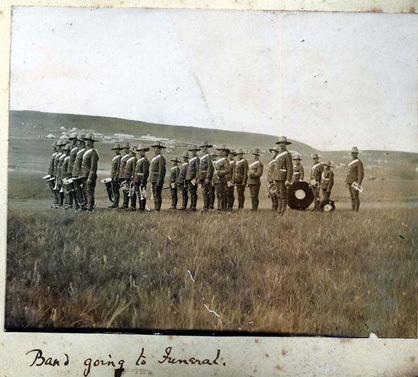 Soon after, he went off to the Boer War and I understand that the 2nd Dragoon Guards remained in South Africa for a further 8 years, as part of the occupying force. He was simply a Private. As I understand it, the Army would not accept responsibility for re-locating his wife, and child, because the Commanding Officer had not given permission for the marriage. After answering a lot of questions, rattling round in my head, it was soon time to focus attention on the “Mysterious Mariners” … and what a revelation that’s been. The numbers keep growing almost daily but, to date, I’ve located the following Seamen/ Mariners to be amongst my dad’s Ancestors. So there you have it. A few of the discoveries I’ve made, so far, about my “Mysterious Musicians and Mariners”. When telling my daughter about this aspect of her Ancestry, her comment was “No wonder Grandad was such an Adventurer, mum”. If you have any thoughts on which of those likely young lads may be my Grandfather, I’d be delighted to hear them. As my heart thrilled to the story of the notorious “Wolf of Badenoch” – those “wyld, wykked Heland-men” burning the famed and majestic Elgin Cathedral I had no idea that later research would show the burial site of John Ogilvie, my Great Great Grand-father, to be in this very same Cathedral Churchyard. John Ogilvie is my dad’s Great Grandfather and the Grandfather of my Grandmother Marie. 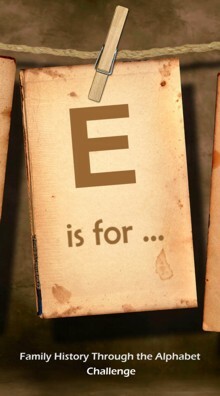 So it is that Elgin represents the letter Ee in my latest “Family History Through the Alphabet” post. 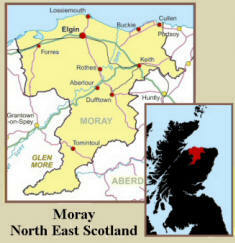 Elgin, as the administrative and commercial capital of Moray,Scotland,has a long and fascinating history. Situated on a low ridge, between the loops of the River Lossie, Elgin was made a Royal Burgh in the 12th Century, by King David I, and in 1107 was chosen as the seat of the Bishop of Moray with its Cathedral located at Spynie, 3kms to the north. 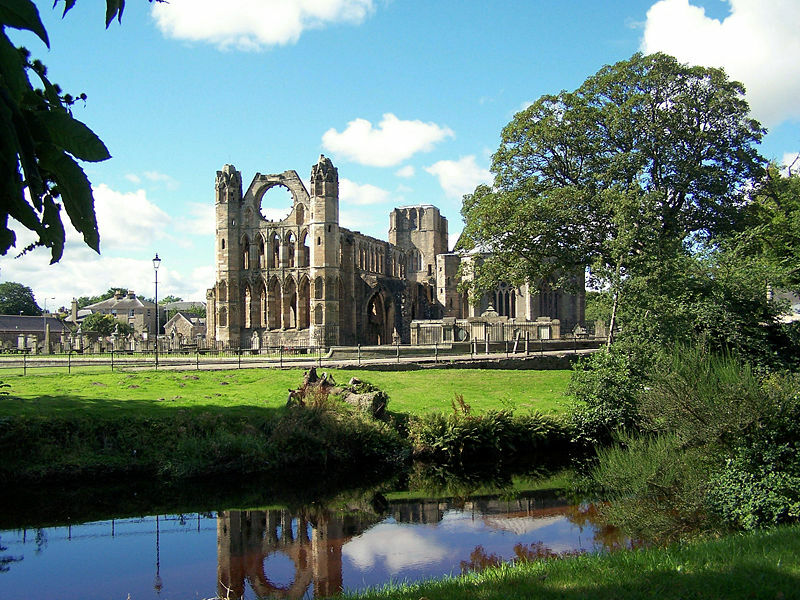 The new Elgin Cathedral was not built until 1224 and on area of ground granted by Alexander II close to the River Lossie and outside of the Burgh of Elgin. 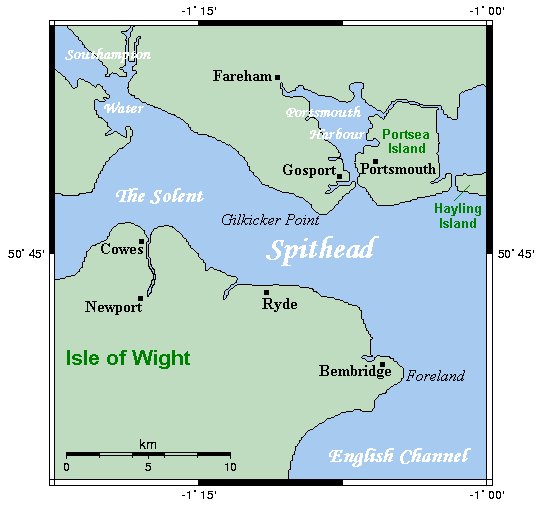 It was a thriving town with its castle on top of Lady Hill in the west and the great Cathedral in the east. 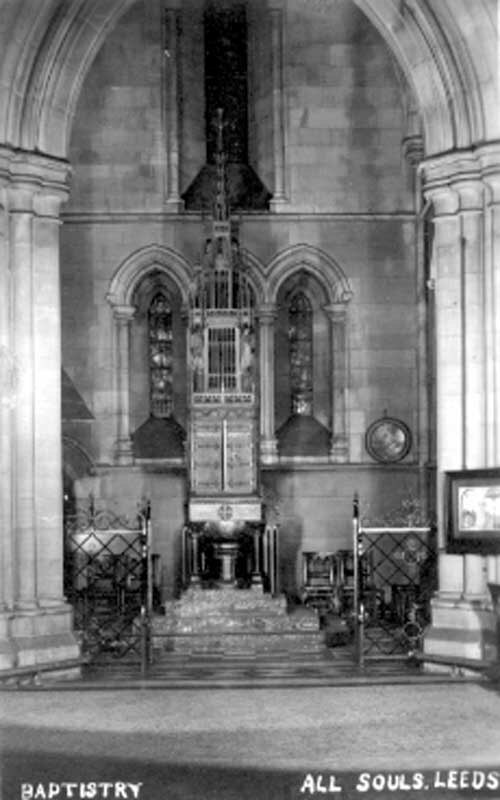 Originally the Cathedral was built as a simple cruciform but, after being damaged by fire in 1270, was expanded with the choir doubled in length, aisles added on each side and an octagonal Chapter House built opening off the north aisle. This magnificent Elgin Cathedral was sometimes known as “The Lantern of the North” but, 120 years after being built, it came under attack and is now a historic ruin. 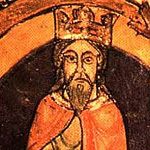 In 1390 Alexander Stewart (Alasdair Mór mac an Rígh), Earl of Buchan and the third surviving son of King Robert II of Scotand, quarrelled seriously with Bishop Alexander Burr, of Moray, who responded by ex-communicating the Earl. An infuriated Stewart, in May 1390 and accompanied by his brigands, descended from his castle in Lochindorb and burned and ransacked the town of Forres. Not satisfied, the following month he burned much of Elgin, incuding two monasteries, St Giles Church, the Hospital of Maison Dieu and the Cathedral, destroying many of its records – legal and monastic. These were irreplaceable and a terrible loss. 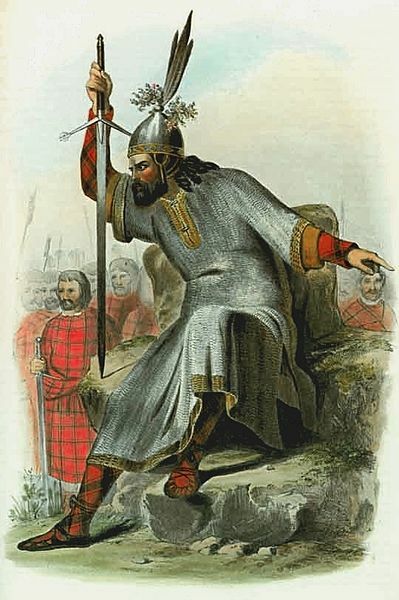 Terrifying the people of Elgin, and forcing them to flee into the countryside, Alexander Stewart became known “The Wolf of Badenoch” and is forever remembered for his burning of the Royal Burgh of Elgin and the destruction of its Cathedral. 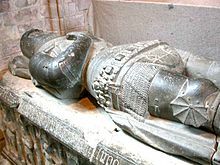 Alexander Stewart lived from 1343 to 20 Jun 1405 and held the positions of Lord Badenoch, Earl of Buchanan and later was his brother’s Royal Deputy in Scotland. Under his father’s watchful eye, nobles and many church dignitaries, Alexander Stewart did penance for his wanton destruction, was pardoned and accepted back into the church. 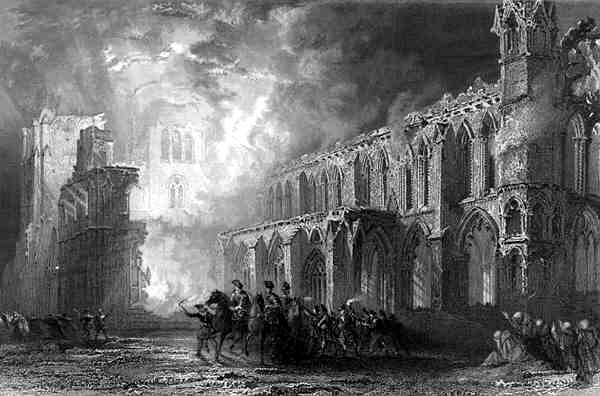 In 1402 the Cathedral precent again suffered an incendiary attack. This time by the followers of the Lord of the Isles and took over 100 years to rebuild. Not completed until 1538 much of the re-construction has since crumbled away, due to the inferior quality of the stone made available to the 15th and 16th century masons, whilst the 13th century construction remains. My Great Great Grandfather, John Ogilvie, was born in Elgin approximately 2 years after John Shanks began his work as a keeper for the Cathedral. At this time, the town had a population of less than 4,000 and was still largely confined to three parallel lines of streets running between the Castle and the precincts of the Cathedral. The 1841 Census shows that, 15 years later, John Ogilvie was living with his parents at “Clarks Close” and his father was working as a Carter whilst the restoration continued. 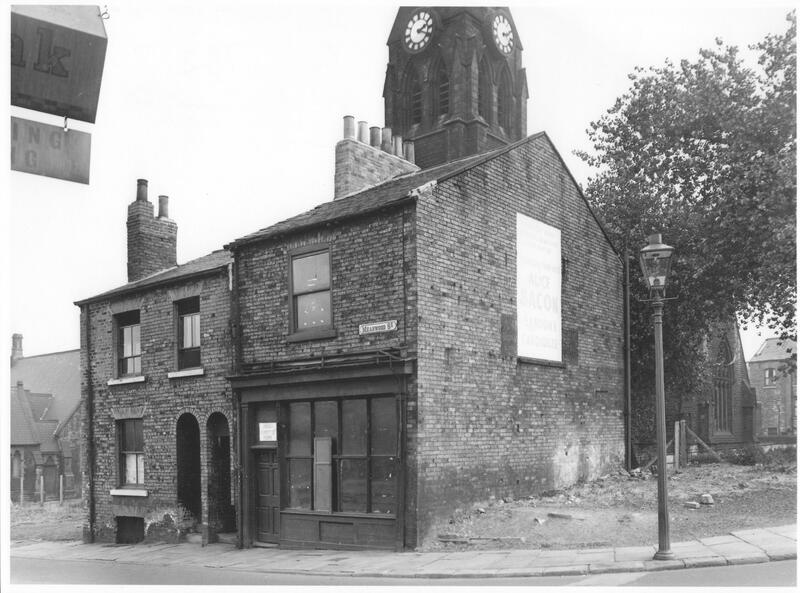 Just 6 years later (1847-8) some of the old houses associated with the cathedral, on it’s west side, were demolished and a series of relative minor changes to the boundary completed. 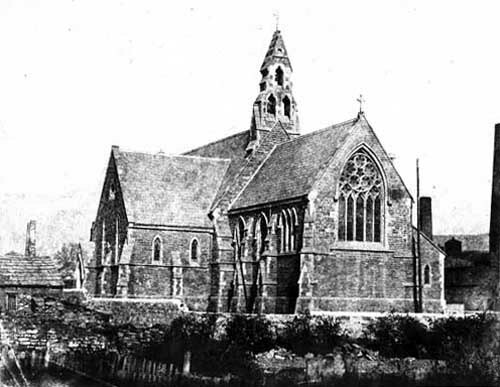 Two years later, on 7 Jun 1850, John Ogilvie married Christina McKenzie at the Elgin Parish Church. John and Christina had four children; Alexander, James (my great grandfather & father of my Marie Ogilvie), and Margaret Ann, followed by Jean. On 10 Jan 1857 when their youngest child was just 3 months old, the family was living at “Mrs Phillip’s Close” and Christina was forced to apply for, and was granted, “Poor Relief”. John, unable to work for some time, had been admitted to Dr Gray’s Hospital and died 16 months later, at the age of 32, leaving Christina to raise their 4 children alone. My Great Grand-father, James Ogilvie, was just 5 years old with 1 older brother and 2 younger sisters. As John’s widow had sought “Poor Relief” only 16months earlier, it’s doubtful there was money for a gravestone, let alone an inscription. It also needs to be considered though that maybe John Ogilvie was not buried in the Cathedral Churchyard, after all, especially as in it’s Dec 2010 Newsletter the “Moray Burial Ground Research Group” reports that as early as March 1848 overcrowding in the Cathedral Churchyard was causing concern. Over the next 10 years the issue was raised several times and eventually, in the early months of 1857, land was purchased to the east of “New Elgin” for the establishment of a new cemetery. On 28 Oct 1858, five months after John died, the “Elgin Courant” reported the first internment. Maybe John Ogilvie was one of the first to be buried in the new cemetery? … This certainly needs to be checked but, in my view, the most likely scenario is that my Great Great Grandfather is indeed buried in the Churchyard of the very Cathedral that those “wyld, wykked Heland-men” tried to destroy. I wonder what John would think about having a whole branch of his ancestories, living here in South Australia, who are delighted to know of their familial link with his birthplace and his final resting place… Elgin, Scotland. 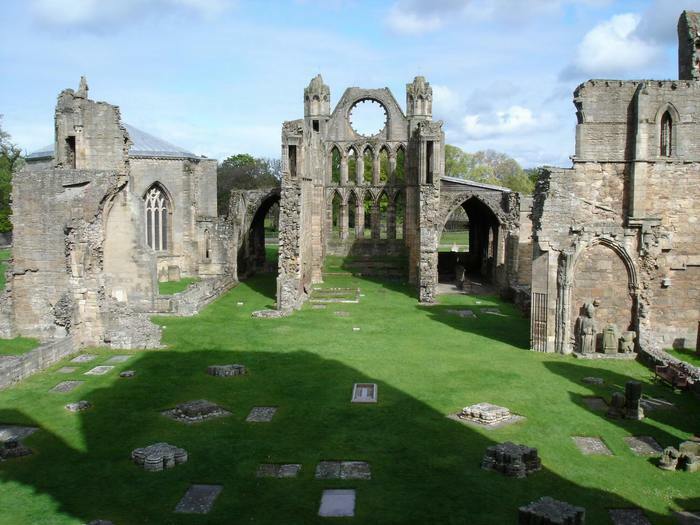 The restoration work continues and the conservation of Elgin Cathedral has been of great concern for successive government departments so that today the ruins remain one of the finest examples of medieval architecture in Scotland. Elgin’s population of less that 4,000, when John Ogilvie was a lad, has grown to 20,000 and much has been done, and continues to be done, to invigorate the centre of the town whilst retaining and restoring the old buildings. A relief road has been built to free the High Street of heavy traffic, and through traffic, and has opened up new vistas toward the Cathedral and Lady Hill. 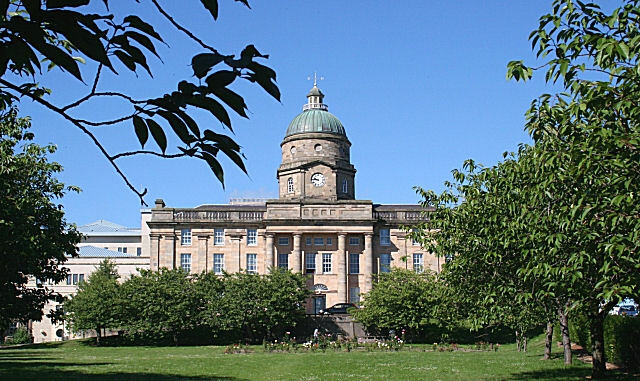 To view magnificent photos of Elgin, as it is today, just click HERE. If you have 24.55mins to spare, I recommend you settle down and enjoy the following Video of Elgin, it’s historic sites and talented people. Ahhh… Christiana Ogilvie. We found you!!! It’s such a joy to find a missing relative but the feelings that wash over me when finding a little child whose memory has become faded, or maybe even lost, in the mists of time are indescribable… and so it was when John and I found his Aunt, little Christiana. John is my second cousin and Great Nephew of my Grandmother, Marie (Ogilvie) Crout. 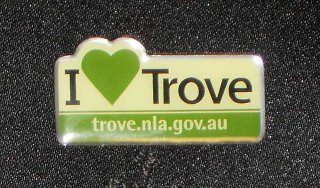 Like Marie, he was born in Leeds, England but he migrated here to Australia, with his wife and family, in the mid 1960’s. We have only recently “found” each other through a joint interest in, and love of, Family History and it’s great fun to share our discoveries. In a recent email he mentioned his mum saying that his dad had a sister who died as a child then shared her birth and death registration dates from his archives. That was it and in no time, at all, we were off and away and soon found the relevant documents to put his Christiana Ogilvie firmly in her place on our shared Family Tree. My Grandmother, Marie Ogilvie, was born the third of seven chilldren to Emma Chadwick and James Ogilvie in 1880, Leeds, England. She had only two brothers and my cousin John’s Grandfather, also named John, was older than Marie by just three years. I’m thinking they must have had warm feelings for each other as Marie had the honoured position as a witness at his Wedding when he married Lucy Ann Johnson in All Souls Church, Leeds, in 1897. Later that year Lucy gave birth to their first child, a little girl, whom they named Christiana. 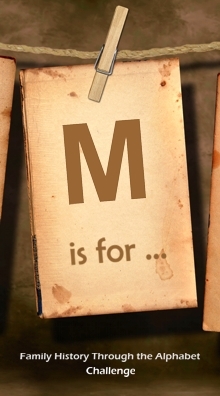 The family were living at 4 Wharfdale Grove, Leeds on 27 Apr 1898, and John was working as a Leather Shaver, when Christiana was Baptised in St Michael Church, Buslingthorpe, Leeds, Yorkshire, England. Sadly little Christiana died in her first year of life and just a few months after being baptised. John and Lucy went on to have another 7 children, four boys and three girls. Their fifth child, Jack, is the father of my 2nd Cousin, John, who is sharing this delightful journey of discovery with me. 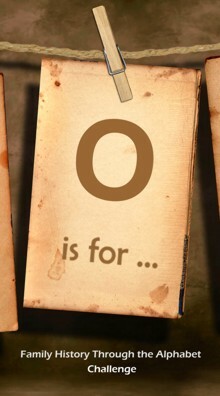 John and Lucy’s last child, Doris, was just 17 months old when her father enlisted in the “6th Battalion, East Yorkshire Regiment“, British Army “Short Service” for the duration of WW1. Sadly John Ogilvie was killed in action in Flanders, France on 13 Mar 1918 and never did return to England and his family. Lucy was both mother and father to their children continuing to live in the home they had shared at 16 Barkley Avenue, Leeds, until she passed away there on 2 Nov 1961, a much loved and honoured mother, grandmother and great grandmother. Christiana was named after her Great Grandmother, Christiana (MacKenzie) Ogilvie who married John Ogilvie in Elgin, Scotland. They had four children; Alexander, James, Margaret (Maggie) and Jean. James took on the trade of “currier”, moved to Leeds, married Emma Chadwick and named their first child, a girl, Christiana after his mother. Their son, John, did the same. 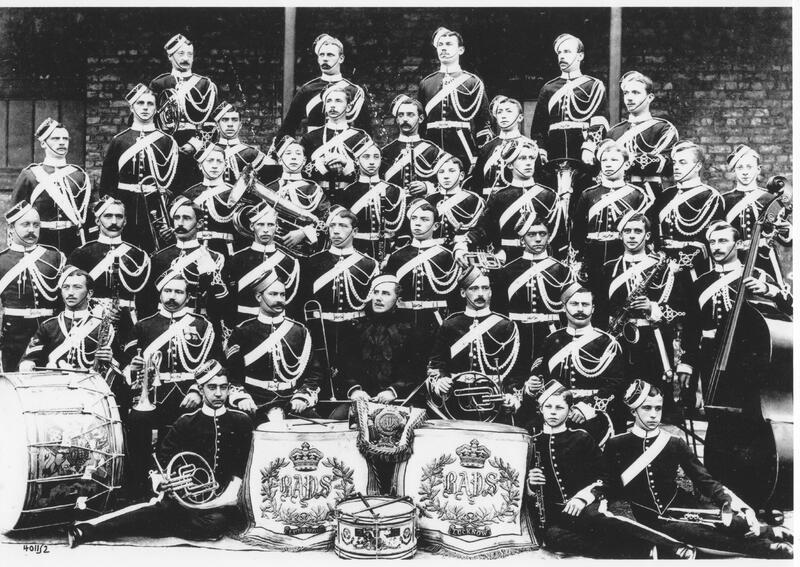 Henry (Harry) Eden Crout, my paternal grandfather, was a clarinet player in the 2nd Dragoon Guards (Queen’s Bays), served in the 2nd Boer War and remained posted to South Africa for a total of 7 years, as part of the “occupying army”. Marie, and their baby daughter Annie Ruby Crout, did not join him and I imagine this is because he most likely did not get his Colonel’s permission to marry. In such cases the Army refused to accept responsibility for the soldier’s family. It’s a long time for a family to be apart which may explain later events. The regimental quick march of the Queen’s Bays (2nd Dragoon Guards). Published in 1952, it is a quickstep adaptation of the Regimental Slow March. 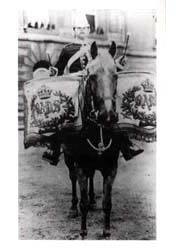 The regimental nickname-‘Rusty Buckles’- originated in the 18th century when at a parade shortly after the regiment returned to England from Ireland it had steel buckles on its saddlery and harness, whereas all other cavalry regiments had changed to brass. Steel buckles were liable to become rusty in wet or damp weather- hence the nickname. Tracking down dad’s Ogilvie family has taken me down many highways and byways, wrong paths and dead ends but finally there they were in Elgin, Moray, Scotland. What a delight! The 1861 Scottish Census showed James, aged 9, living with his widowed mother, Christina, and two younger sisters Maggie and Jean but provided no name for his dad. 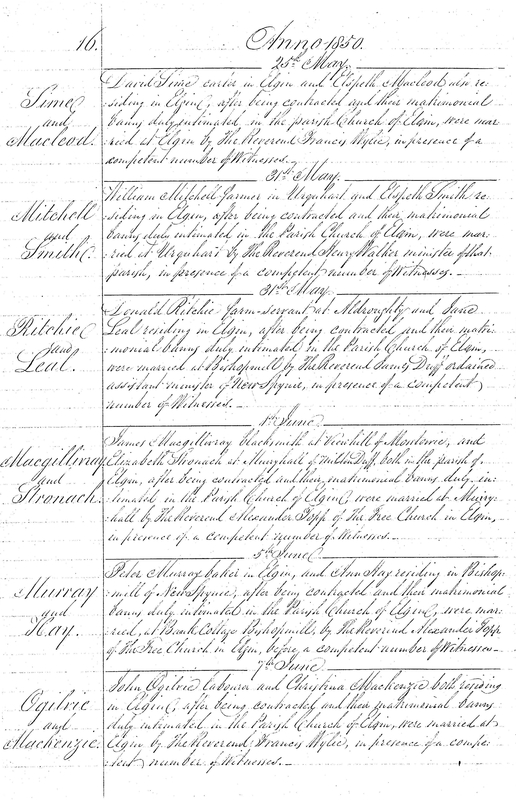 Through “Scotland’s People” I managed to access my Great Great Grandparent’s Marriage Certificate and discovered that John Ogilvie, labourer, married Christina MacKenzie at Elgin Parish Church on 7 Jun 1850. Finally there it was, my Great Great Grandfather’s name – John Ogilvie! So, what happened to John? Did he really die young, or… did the Census taker record the info incorrectly, or… was Christina declaring herself a widow only to explain the absence of a husband/father? Once again, “Scotland’s People” came up with the answer in the form of John’s Death Certificate. This showed he died at home, 49 High Street, on 8 May 1858 and his brother James reported his death. Known cause of death is not given, which is rather unusual, but there’s a reference to a Doctor’s Certificate which suggests John may have been ill for some time. Also recorded is John Ogilvie’s burial in Elgin Cathedral Churchyard. Some time later, after discovering the wonder that is “The Moray Burial Ground Research Group”, I checked their Data Base and found a joint Ogilvie Grave that seemed John’s likely burial site. Unfortunately the photos & transcript showed that my John Ogilvie is not buried in this grave. Burial of John Ogilvie at Elgin Cathedral Churchyard. From the death certificate, one can only assume that he was buried there. All the visible stones in that churchyard have been recorded and published and abstracted data is as on-line. This suggests that a) there was no headstone, b) a stone may have been placed but damaged, removed, lost over the years (this is not uncommon – some sandstone monuments suffer from frost and often delaminate – the inscribed surface just crumbling away c) the stone was a flat one, which has become buried over time and is no longer visible – Elgin Cathedral is a very important archaelogical/historic site in Elgin, and is managed by Historic Scotland, who to date have not give us permission to investigate the presence of such buried stones. Also, we have cases where buried stones of this type are in fact blank – perhaps the family unable to afford a mason to inscribe the stone. In this they’re referring to the New Elgin Cemetery, not the Elgin Cathedral Churchyard, but makes me think that John may be buried in an un-named Pauper’s Grave somewhere. 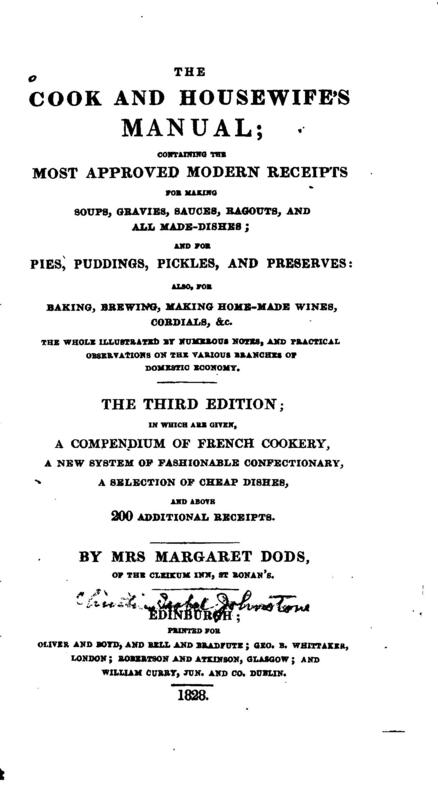 It’s recorded that on 10 Jan 1857, over a year before his death, John Ogilvie had been unable to work for some time, was admitted to Gray’s Hospital, and Christina Ogilvie had applied for “Poor Relief”. Difficult times, indeed, for my Great Great Grandparents and even more difficult times ahead for the widowed Christina left with a young family to raise alone. The wails of the newborn babe reverberate through the ward and down the passage of the Leeds Maternity Hospital, Hyde Street, Yorkshire, England as Marie (Ogilvie) Crout gives birth to her first, and only son, Harry Scarborough Crout. Curious about this house… dad’s first home, I did a search of the Leodis data base and was delighted to discover three photos taken, from different vantage points, before being demolished to make way for new road works. Great excitement when the photos arrived. It’s like touching the past. My daughter, and I, went over them with a magnifying glass and decided that Marie’s abode at 10 Meanwood Street was on the left, at the rear of the building. Always questioning, I wondered why she stayed in this particular house?… Was it the home of friends, or maybe relatives? The 1901 UK Census showed that eleven years earlier, Marie’s mum, dad and 5 younger siblings were living at 34 Servia Road, so seemed unlikely to be the family home. I let the question go and turned my attention to other matters. A year, or so, later “the house in Leeds” became a matter of interest again. Delighted to be in contact with an Ogilvie 2nd cousin, from Leeds, I mentioned that my dad always said he had cousins in Western Australia but I had no idea who they were or where they were likely to be living. Finding them was especially complicated because it seemed their mum was a sister of Marie Ogilvie. Was it a sister who emigrated? If so, who was that sister? Did she marry? If she married, what was her new name? When did she come? … All were questions I’d mused over throughout the years, then John passed on one bit of information which changed everything. He recalled that the relative was female and moved to Western Australia before WW1. Sadly he believed it unlikely she ever knew that her brother John had been killed in the War. Well, that provided a time frame and certainly focused the attention. Remembering that the 1911 UK Census had recently been released, I did a search to find out where members of the Ogilvie family were living in 1911, the year before dad’s birth, and there it was at last! … The answer to that ongoing and perplexing question was sitting there, shining like a sparkling jewel, just waiting to be picked up. 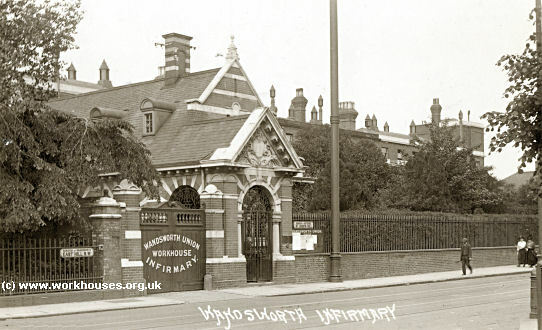 When Marie (Ogilvie) Crout gave birth to my dad, at Leeds Maternity Hospital, she was temporarily living with her widowed mum, sisters Maggie Ogilvie and Lucy Bartle, brother-in-law Walter Bartle and 4 year old nephew, Leslie Ogilvie, in the 5 roomed home at 10 Meanwood Street, Leeds. Whooo Hooo!! !… puzzle solved at long last. Further research revealed that 8 months later Maggie married John Henry Baxter. They migrated to Western Australia the following year with John travelling on ahead and Maggie arriving at Fremantle, aboard the SS “Otrantra”, on 14 Oct 1913 but that’s another wonderful story to be told on another day. Many thanks to my cousin for sharing his precious morsel of info which enabled the sidestepping of that particular “brick wall”. It never fails to amaze how such seemingly inconsequential “rememberings” can make a huge difference when re-constructing the events of yesteryear. 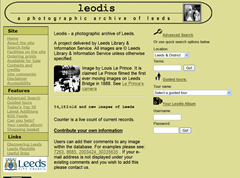 Thanks also to Leeds City Council and the Leeds Library & Information Service for “Leodis”, its photographic archive of Leeds. Containing 52,000 new and old images it’s a joyous treasure house to those, especially from across the seas, who are researching Family History.